I’m finally posting a new recipe! Gold star for me! It turns out that being less than six weeks away from your incredibly DIY’d wedding, having a partner who has just got a new job, and having to find a new flat and move into it before said wedding, means that you just don’t have the time for writing things. Sorry, not sorry. I’ve still been baking away in the kitchen though – I’ll hopefully be sharing some gorgeous Oreo Rocky Road with you in the next few weeks (if I can ever find time to photograph it before Katie demolishes it). I also learn’t a valuable lesson this week. Don’t bake cupcakes with sour cream if you’ve left it out of the fridge overnight. It turns out that non-refrigerated sour cream doesn’t make for a tasty experience. Who knew? Anyway, enough rambling. I’ve never actually baked blondies before – to be completely honest, I don’t think I even knew what blondies were before about a year ago. But I decided to get in the kitchen and give them a go. And me being me, I didn’t want to miss the opportunity of adding some chocolate in there. Oh, and peanut butter. Of course. These guys are soft and chewy little squares of peanut butter joy. They are based on a cake recipe, but with a whole lot less flour and a whole load more sugar, giving them a much softer texture. They even have that crackled top that I love, just like a chocolate brownie. 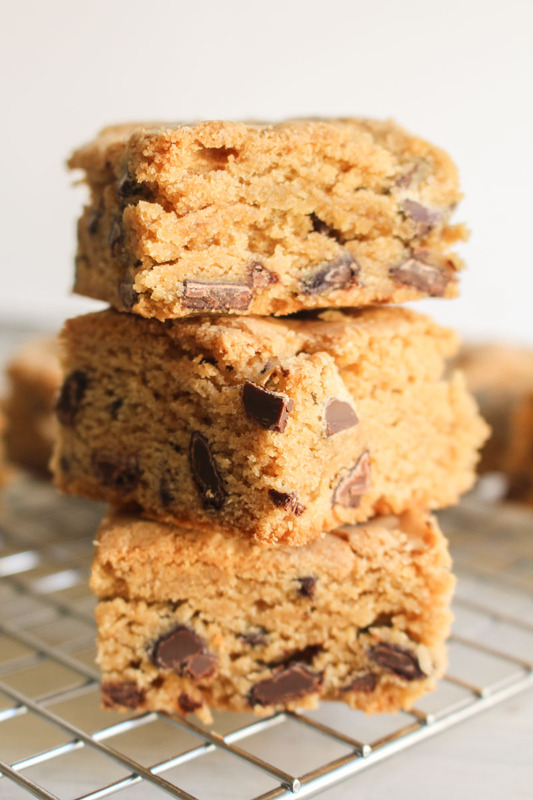 You are definitely going to need to use smooth peanut butter in these, and make sure you use the highest quality chocolate chunks you can get your hands on. It will make all the difference. I would actually recommend breaking up a great bar of chocolate by hand if you can only find cheap chocolate chunks in the baking aisle. You will see that I used unsalted butter in my recipe, and didn’t add any extra salt either. Don’t worry, I haven’t lost my mind just yet. I find that the peanut butter is salty enough, but feel free to add a little extra salt if you think you need it. Well that was quick and easy. Just like these blondies. I hope to be back in the kitchen at some point before the big day, if not just to test out my final wedding cake choices (that sounds like a bloody good idea for a post, right?). But if not, I promise that normal service will be resumed after I’ve walked down the aisle. And I’m sure there will be some wedding posts to follow too – I’m going to have to let you know how the wedding cake turns out, at the very least. 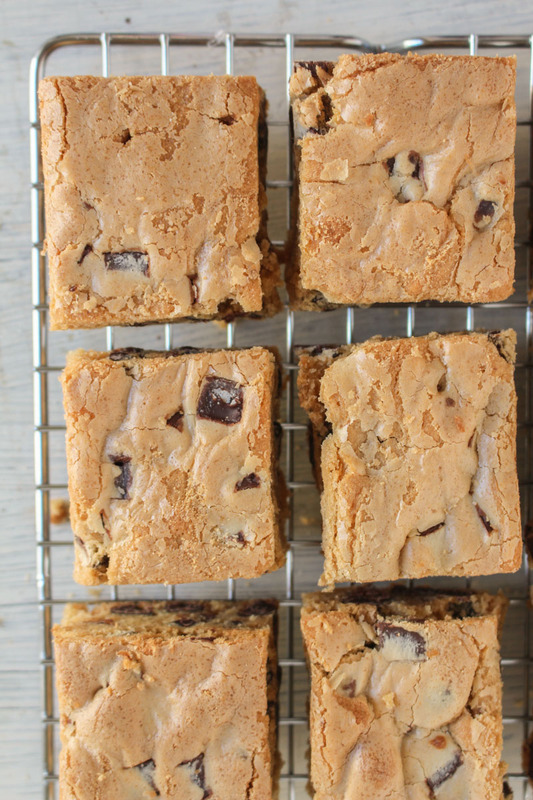 Forget brownies, these peanut butter and chocolate chip brownies are what you need to bake this weekend. Can be made gluten free. Preheat the oven to 180°C / 350°F (160°C fan), and line an 8 inch square brownie tin with baking parchment or greaseproof paper. Using a stand or hand mixer, cream the butter and peanut butter together. Add the sugar, and beat well until light and fluffy. Add the eggs, one at a time, beating well between each addition. Add the vanilla extract and beat well for a minute or so, until the mixture is light and creamy. Add the flour and baking powder, and gently mix together on a low speed, until the flour is fully combined. Add the chocolate chunks and mix. Spoon the batter into the lined brownie tin and level out with a wooden spoon. Bake for 30 minutes, until a skewer or toothpick inserted into the middle comes out almost clean. Leave to cool in the tin on a wire rack, and when completely cool cut into 16 squares. 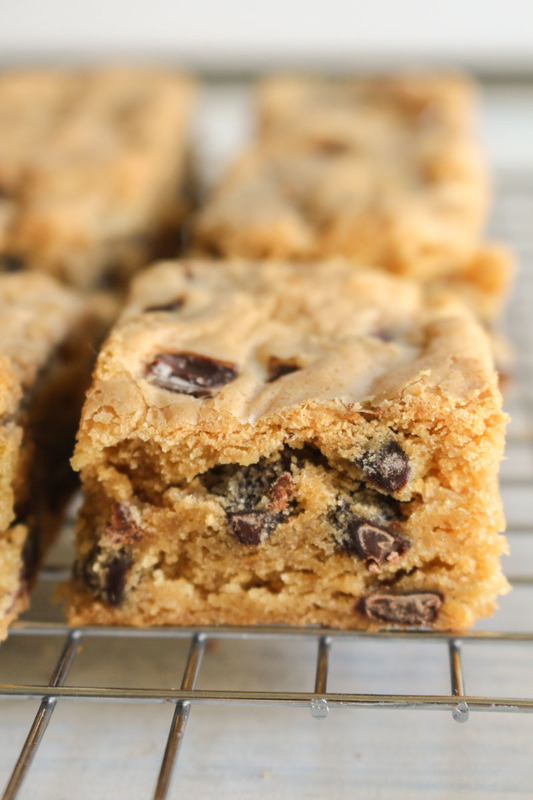 Keep these blondies in an air-tight container for up to a week. They can be frozen for 2-3 months. Blogging is hard so we understand. Regardless, thanks for sharing yet another delicious recipe. Wish Me Luck and 2018-Best?! Good luck Tiffany! I hope 2018 is a year of great baking for you ?